The other day I posed a simple question: How far do you sit from your TV? The results show that many of you are not getting all the definition out of your HDTV. How Far Do You Sit From Your HDTV? The truth is that most of us are probably not getting the most out of our HDTV. As mentioned, the Lechner Distance chart illustrates that there are specific distances at which the human eye has the best chance of processing all of the detail that HDTV resolution has to offer. According to the data collected in the poll, many of you are probably sitting too far away, especially those of you who sprung for a 1080p set. Poll results in the 1080i/1080p group for sets under 40-inches indicated that a whopping of 60% of respondents were sitting over six feet from the screen. This is definitely too far away to see all of the detail. For sets between 40 and 52 inches, 43% of you are sitting over eight feet from the screen. Again, too far away to see it all. For sets over 52-inches, 35% are sitting between 8 and 10 feet, while 30% are sitting over 10 feet away. To put it in perspective, a 60-inch 1080p set should be about 8 feet (or closer) from you to get the full experience. Even a huge 70-inch 1080p TV should technically only be nine or so feet from your head! You will notice that we didn't go into detail about those of you who responded to the 720p portion of the test, and that's because, by and large, you are watching at about the right distance. 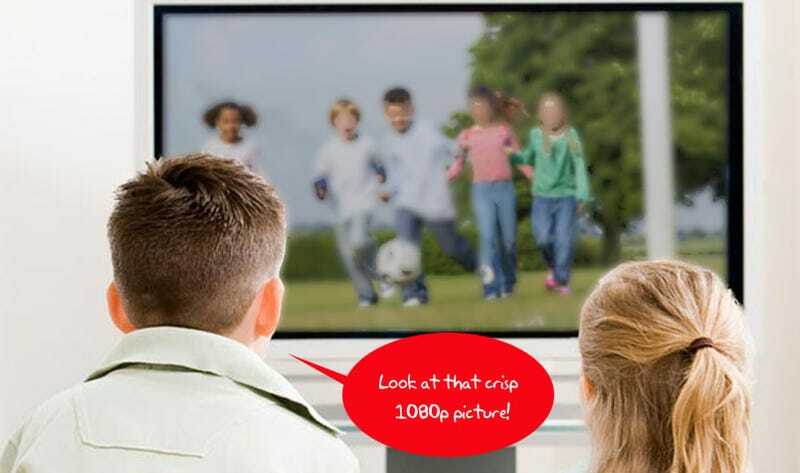 720p TVs can be set out farther than 1080p, yet because they're cheaper, they find their way into smaller living rooms. Because of the interplay of these two factors, 720p sets are all the more likely to be set up at an optimal viewing distance. But 1080p, considered better, winds up in larger living rooms, but not always at larger sizes. The joke is, by keeping it as far off as we noted above, you are not much better off with that fancy 1080p set than you would have been, saving some cash and going with 720p. A final observation is that 6 to 8 feet is far and away the most common distance across all TV sizes and resolutions for you folks—we don't know what it means except that there are other factors besides Lechner distance that play a larger part in the decision to place the TV, and that most of us—Giz editors included—are unaware that we are not getting the full bang for our HDTV buck.